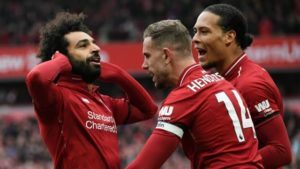 With only 4 gameweeks to go in the Premier League, and a dynamic title race challenge between Manchester City and Liverpool, every game is proving to be a test for these two. Liverpool , however have conquered the Chelsea challenge with some style at Anfield. It is often said that Mohamed Salah doesn’t come alive in big games but the Egyptian was instrumental in securing this important victory for the Reds. The first half was a stalemate between an aggressive Liverpool side and a cautious Chelsea side. The deadlock was broken by Mane who headed home a deft cross by skipper Henderson. Coming back to Salah’s performance, a world class 35 yard strike from the winger beat Kepa to put up 2 goals on the board for the Merseyside team. Counterpart Eden Hazard however missed two point blank range shots and was a reflection of the side’s poor finishing in general. The pressure is definitely on City now that Liverpool enjoy a relatively easy set of fixtures. City have to face Tottenham and United in their next two games in the league. Jurgen Klopp’s side looks in great shape in terms of chances to win silverware finally. “We don’t know. We have to try at least. We respect all the opponents so much. First Porto is difficult, then Cardiff and we know they fight against relegation. It’ll be real tough.”, said Klopp.